Advance payment of tax is another method of collection of tax by the Central Government in the form of pre-paid taxes. Such advance tax is in addition to deduction of tax at source or collection of tax at source. Scheme of advance payment of tax is also known as 'Pay as you Earn' scheme i.e., an assessee is required to pay tax in a particular financial year, preceding the assessment year, on the basis of his estimated income. 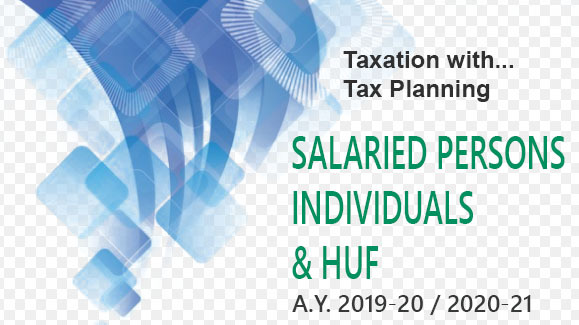 This would mean that though the income earned during the previous year 2018-19 is taxable in the assessment year 2019-20, tax on such income is payable during the financial year 2018-19 under the scheme of advance payment of tax. As per the various provisions of advance tax [sections 208 to 219], tax shall be payable in advance during the financial year in respect of the total income of the assessee which would be chargeable to tax for the assessment year immediately following that financial year. Such total income shall be referred to as "Current income" in this Chapter. We know that income earned during the financial year 2017-18 shall be charged to tax in the assessment year 2018-19. But the assessee is required to pay tax, in advance, on the taxable income of financial year 2017-18 during the financial year 2017-18 itself. 'Current income' will include all items of income. It includes capital gains (both long-term and short-term), winnings from lotteries, crossword puzzles, etc. For computation of advance tax on the current non-agricultural income, even agricultural income will be included for rate purposes, wherever as per provisions of the Income-tax Act, it is required to be so included. Advance Tax, as computed in accordance with the provisions of this Chapter, shall be payable during a financial year, only when the amount of such advance tax payable by the assessee during that year is Rs.10,000 or more. is of the age of sixty years (60 years) or more at any time during the previous year. On or before the 15th June Not less than 15%, of such advance tax. On or before the 15th September Not less than 45% of such advance tax, as reduced by the amount, if any, paid in the earlier instalment. On or before the 15th December Not less than 75% . of such advance tax, as reduced by the amount or amounts, if any, paid in the earlier instalment or instalments. Where advance tax is payable by virtue of the notice of demand issued by the Assessing Officer, the whole or the appropriate part of the advance tax shall be payable in the remaining instalments. Any payment of advance tax made on or before March 31 shall be treated as advance tax paid during the financial year. 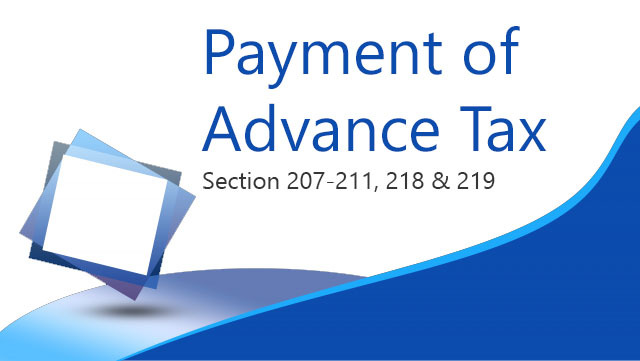 If the last day for payment of any instalment of advance tax is a day on which the receiving bank is closed, the assessee can make the payment on the next immediately following working day, and in such case, the mandatory interest leviable under sections 234B and 234C would not be charged. income of the nature referred to in section 115BBDA(1) i.e. the dividend received is in excess of Rs. 10,00,000. Therefore, in such cases, it is provided that if any such income arises after the due date of any instalment, then, the entire amount of tax payable (after deduction of tax at source, if any) on such capital gain or winnings from lotteries, etc. or income from business or profession or income from dividend should be paid in remaining instalments of advance tax which are due or where no such instalment is due, by 31st March of the relevant Financial Year. If the entire amount of tax payable is so paid, then no interest on late payment will be leviable. 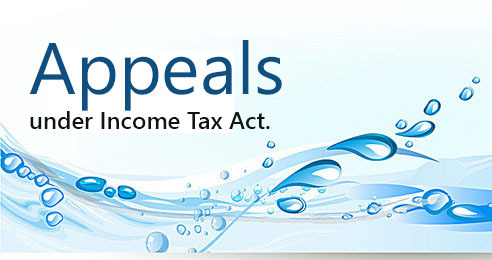 Interest is payable if an assessee who is liable to pay advance tax, has failed to pay such tax. It is also payable if an assessee has paid advance tax but the amount of advance tax paid by him is less than 90 per cent of assessed tax. Interest is payable on short-term or non-payment at the rate of 1% p.m. (per month) (or part thereof). From April 1 of the assessment year to the date of determination of income under section 143(1) or where regular assessment is made to the date of regular assessment. It is payable on “x”. x = Assessed tax (as per assessment order) as reduced by tax deducted or collected at source or relief under section 90/90A/91, MAT credit under section 115JAA and alternate minimum tax credit under section 115JD on any income which is taken into account in computing advance tax. Interest under section 234B is not applicable if advance tax paid during the financial year (i.e., April 1 to March 31 immediately preceding assessment year) is 90 per cent (or more) of x. Further interest is not payable if x is less than Rs. 10,000. Marginal relief shall be available and, in such cases, the total amount payable as income-tax and surcharge on current income exceeding Rs. 50,00,000/ Rs.1 Crore, as the case may be, shall not exceed the total amount payable as income-tax on a current income of Rs.50,00,000/ Rs.1 Crore by more than the amount of income that exceeds Rs.500,00,000 / Rs.1 Crore. Similarly, marginal relief will also be available where the current income of the company exceeds Rs.1 Crore or Rs.10 Crore, as the case may be. Education cess of 2% shall be levied on the total tax (including surcharge if any) payable by all assessees (whether resident or non-resident). In all the above cases, SHEC @ 1% shall be levied on total tax (including surcharge but excluding education cess) payable by the assessee.